Image: DC Comics. Art by Doug Mahnke, Jaime Mendoza, Wil Quintana and Rob Leigh. If you’ve been following Superman comics recently, then you’re gonna be fully aware that the Man of Steel has been having one hell of a time. He had his identity made public. Then he died, replaced by the version of himself from before the New 52 reboot. And then, another Clark Kent showed up, claiming to never have been Superman at all. 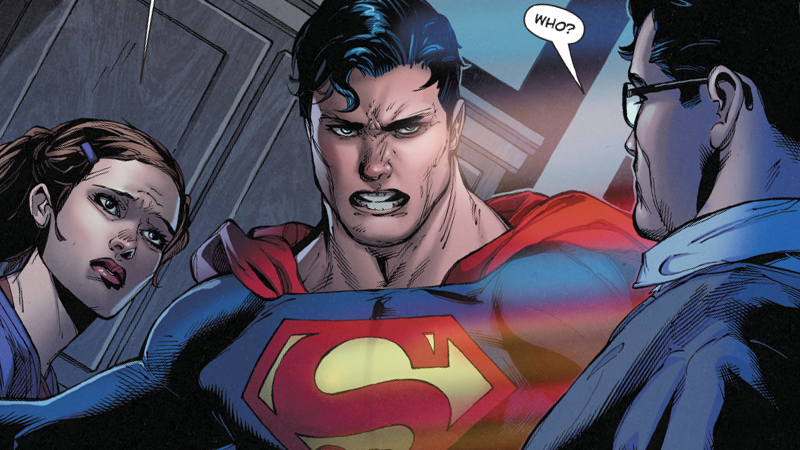 The mystery surrounding this other Clark Kent—who asserted that, before the New 52 Superman died, the hero sent him into hiding and assumed his identity to protect the reporter during a story he was investigating—has been percolating throughout the pages of Superman and Action Comics for a few months now. But today’s Action Comics #975—by Dan Jurgens, Doug Mahnke, Jaime Mendoza, Wil Quintana and Rob Leigh—has lifted the lid on just who this faux Clark Kent is, after Clark and Lois realize that he’s behind the disappearance of their son Jon in the previous issue. Filled with rage, the real Clark and his wife confront the imposter, who finally gives up the jig—but not without teasing some different potential identities that have been cropping up in fan theories around the mystery, like Lex Luthor, Braniac, and Bizarro Superman. The answer, in the end, is not that obvious. ...because it’s none other than Mr. Mxyzptlk, the impish, fourth-wall-breaking wanderer of the fifth dimension. So why has Mxyzptlk been wandering around as Clark Kent? Well, apparently, his long absence from the DC comics universe has been part of the reason. His absence has made him furiously jealous of Superman’s family, believing that the Man of Steel has cast Mxyzptlk aside—so he intends to rob Clark and Lois of the memory of their son in vengeance, whisking Jon off into his own dimension while slowly erasing the memories they have of their child. The backup story of the issue—from Paul Dini, Ian Churchill, Mike Atiyeh, and Rob Leigh—gives us a little more explanation for where Mxyzptlk has been, as he recounts to the captive Jon just how he came back into the world after his time away. Apparently the hooded Mr. Oz, who’s been wandering around the DC Rebirth universe since it began, has some ominous plans in store for Superman... plans that could be disrupted by a maniacal fifth-dimensional superbeing who can warp reality. Around the time of the New 52 universe’s creation, Mr. Oz decided to lock Mxyzptlk out of time and space, in a place where his powers couldn’t work, to stop him from interfering in whatever machinations Oz has plotted. But there’s a layer of tragedy to it, too—because at first, Mxyzptlk doesn’t actually mind Oz’s incarceration because he believes that Superman will come and rescue him. As a wanderer of all dimensions, Mxyzptlk believes he has the bigger picture of Superman’s life across all sorts of forms, from the comics to the cartoon shows to the merchandise. He thinks, in a slightly misguided way, that he has a bond with the Man of Tomorrow no one else ever could, and it’s a faith that keeps him going in Oz’s prison for a while. That is, until he finally realizes that Superman isn’t coming to save him (mainly because, in “our” world, Mxyzptlk’s Superman had ceased to exist—replaced by the younger New 52 Superman, who of course, had never met Mr. Mxyzptlk). So Mxyzptlk decides to use the magic word—his name backwards—to send himself back to the Fifth Dimension. Then, to avoid the further wrath of Mr. Oz, he goes into hiding in the rebuilt DC universe with a new persona... and who else would he know better other than Clark Kent? Altering even his own mind so he could truly believe he was Clark Kent, Mxyzptlk became the biggest mystery of DC’s Rebirth line. But now he’s back. And he’s not feeling quite so playful anymore.